Its customers were asking for it and now Surtees has delivered. 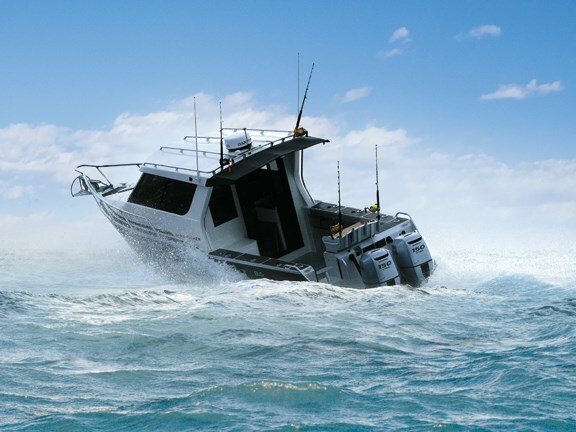 The company’s new flagship 8.5m Gamefisher is ready for action and Trade-A-Boat gets first dibs. We headed to Whakatane to give it a thorough workout in its home waters. You asked for it, you got it. The BIG Surtees 8.5 Gamefisher. Cost aside, bigger is generally always better, and after falling for Surtees' superior build quality, clever tricks, fishable features, and smooth ride, its customers begged for more. The new bigger 8.5 Gamefisher is arguably its best trick yet; in true Surtees style it wouldn't settle for anything but the best, taking a painstaking year to design and build using only the best materials available. Surtees markets its boats as 'built to fish', and it's no secret they come packed with clever features to help fill the bins. The cockpit is large with an equally large bait station featuring a freshwater tap, four angled rod holders, and two cup/sinker holders. The wide, thigh-high gunwales have a further three rod holders and complementary refreshment holders per side. Two further rod holders on the transom are specifically angled for trolling lures. A canvas shade extension offers some sun protection while still allowing plenty of open casting room. While it does impede access to the eight rod holders in the overhead rocket launcher when extended, it can be slid back into the hardtop or completely removed when required. A removable walk-through transom door drops into place to reduce water intake when backing down on a rampaging marlin, with the easily-accessed and viewed live-bait tank directly below. Two large underfloor bins provide plenty of catch and dive gear storage. A drop down rear seat is also a good spot to sit while wrestling with a shrunken wetsuit. There are also plenty of additional features and customisation options available. After a late evening photo shoot I dragged the Surtees team out of bed bright and early with the promise of blue skies to show off the 8.5 Gamefisher's pristine paint job. It took a while for the blue skies to respond to the invitation, but at least there was plenty of chop and swell around early on to put the boat's credentials to the test. We headed out through the sloppy Whakatane bar towards Whale Island, taking the opportunity to unleash the 300 horses bolted to the stern along the way. Pushing the big Surtees way past the realms of recreational use proved no issue for the solid hull. High speed turns were tight and cavitation free, and running at WOT through a snotty sea left all our joints and fillings intact. The hydraulic flooding keel holds a whopping 600 litres and can be opened and closed with the flick of a switch from the helm; the crappy conditions allowed this feature to be fully tested and it does make a noticeable difference to the ride in rough water by reducing hull lift and forcing the sharp, strake-less hull to slice through - a.k.a. 'wave devastation mode'. You lose a bit of speed and holeshot but gain plenty of comfort. As a comparison, at 5000rpm with a following sea and the ballast closed we recorded 30 knots. Flicking the switch to open and discharging the ballast saw our speed climb steadily to 33 knots for the same revs. The 150hp Honda four-strokes have a great sound to them, which isn't too loud considering all that grunt - smooth would be an understatement. Of course, having two engines makes the sound and smoothness even better, and they also enhance manoeuvrability. But how well would the big boat go in the unlikely event of one engine failing? Well, we couldn't get it to plane on one outboard (with the other trimmed right up), but at 3000rpm she's doing 9 knots, which should still get you home quicker than a tow would. Single outboard and diesel inboard options are also available. The team at Surtees is full of good ideas, and a lot of features that are optional extras on its smaller boats are standard on the 8.5 Gamefisher; in fact, everything apart from the electronics and engine(s) comes standard. One user-friendly upgrade is the hydraulic ballast flap, which is easily operated via a switch on the dash. Anchoring can also be easily controlled with a substantial Savwinch drum winch, offering an electronically-controlled variable speed drive for working different depths. It also comes loaded with 200m of anchor warp. Sliding side windows open both front and back and a further rear window drops down to allow good ventilation. 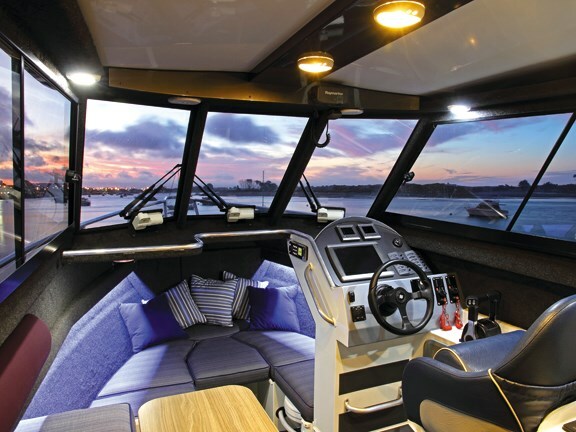 Large bi-fold doors open out onto the cockpit to ensure great flow in and out and keep the skipper in touch with the action out back. There's also good headroom throughout with plenty of underseat and underfloor storage to maintain a clutter-free environment. The hardtop is insulated for year-round comfort and reduced condensation. As is the case with all Surtees boats, no space has been left under-utilised. A comfortable L-shaped couch lies to port with a drop-down table and bunk extension creating a second bed to complement the large double berth up front. The table twists sideways to create extra standing room if required. Stylish anti-slam drawers are located at either end. Twin gas hobs and a freshwater sink lie to starboard with a 75-litre electric fridge neatly fitted beneath the deluxe helm seat, which itself features a flip-up bolster for either back of leg support or extra standing room. Up front, 1.9m bunks with in-fills allow two people with long legs to enjoy an uncramped night's sleep. An electric toilet resides below with a privacy screen available as an option. This boat will comfortably overnight three adults or your average family of four with younger children. 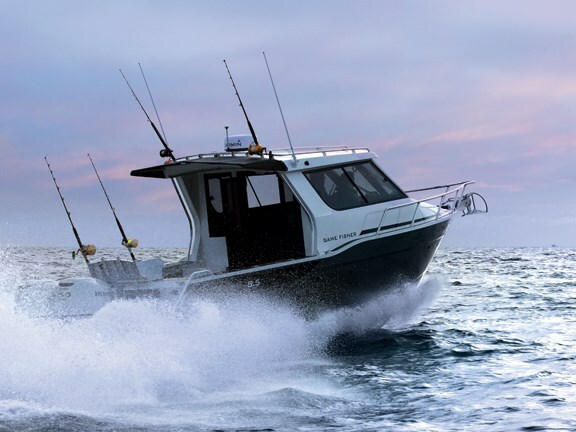 Expansive views, a well laid out dash, ergonomic controls, and automatic trim tabs certainly make the 8.5 Gamefisher an enjoyable and rewarding boat to helm. Of course, the sports car-like performance and smooth, predictable ride also helped in this regard. Relinquishing the helm at the end of the test was no easy feat. At almost 3.5 tonnes she's certainly a big, solid boat to be towing around, but with a capable tow vehicle no fish will be safe. The Surtees-built tandem-axle trailer features braked stainless steel callipers on all four wheels, and the Carlisle Hydrastar electronic braking system means any able vehicle can be used to tow it without requiring specialised wiring. The electronic controller simply plugs into your cigarette lighter, allowing the trailer's braking force to be adjusted to suit. With Surtees' clever self-loading trailer catch, launching and retrieving was a simple drive on/drive off affair, which, judging by the look on their faces, left many other boaties at the ramp feeling rather jealous. Surtees Boats managing director Phil Sheaff explains why they've decided to go bigger: "A lot of guys with Surtees 6.7s and 7.3s wanted a bigger boat and wanted that boat to be a Surtees. With us not having a bigger model they had to go to other brands, so we decided to go after that market. We're really happy with the outcome and tried hard with the styling to make sure the 8.5 Gamefisher looks like a Surtees." Surtees boats are in hot demand, and at the time of writing Surtees has 126 on its order books. Sheaff says it's also making inroads in Australia: "We've got a really good network of dealers in Australia now with two in Victoria, two in New South Wales, and one in every other state." This year will see Surtees celebrating its 20th anniversary as well as the fact that it's never had a hull failure. To commemorate the milestone, plans are taking shape for a special edition Surtees. Sheaff hints at what it might look like: "The first boat Neil Surtees built was a 6.1 Barcrusher so we thought we might revamp it, but possibly take it up to a 6.3m or 6.4m hull, which would fit nicely between our 5.8m and 6.7m models." Even with 21 boat show awards to its credit, Surtees Boats isn't resting on its laurels, nor will it sacrifice build-quality to increase profits. 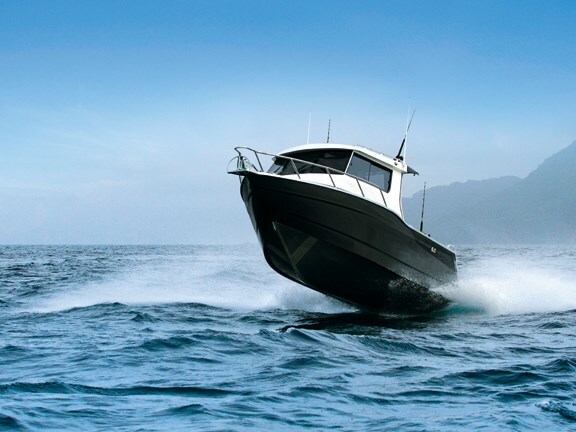 Schick explains why it's so obsessed with quality: "Our boats come with a six-year worldwide hull warranty. We send them up to the Pacific islands and also have a few in Vancouver, Sweden, and England now, so imagine the cost if something failed over there. That's why everything's over-engineered on our boats." Schick says with its production numbers it would be more economical to import parts from China, but that's not going to happen on his watch. "We like to support our local guys and try to use as many local products as possible. The more money we spend in New Zealand the better it is for us, and everybody benefits." Surtees has just installed a state-of-the-art paint booth to allow better quality control and a quicker turnaround to try and keep pace with demand. Every boat that leaves the Surtees factory is CE-rated and is also built to meet Survey standards, only requiring a windscreen swap to 6mm clear glass to get approval. It's one of only a select few New Zealand companies to achieve the stringent CE certification. Surtees' biggest and cleverest offering yet certainly sets the bar very high. Its head-turning looks, comfortable accommodation, and all-round capabilities make it a winner in my book. With the new 8.5 Gamefisher, heading out wide in comfort and style is all but assured. For more information on the Surtees 8.5 Gamefisher contact Cliff Schick at Surtees Boats on 07 322 8461, email cliff@surteesboats.com or visit surteesboats.com.